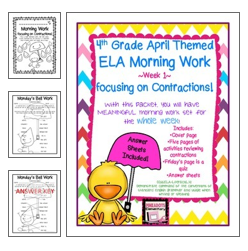 Pinkadots Elementary : Why I do What I do...homework edition & FREEBIE! Why I do What I do...homework edition & FREEBIE! I am linking up with Christina today from Bunting, Books, and Bright Ideas for this informative linky. I thought it would be the perfect idea to tell you about our homework plan. To keep myself organized and plan ahead. We copy all of our homework ahead of time. Robyn is the super organized teacher and already has homework for the WHOLE year copied and ready to go. I just have a master copy printed out for each week and will copy a few weeks at a time. I found copying homework for the week and creating a packet teaches students responsibility. It helps them plan their time accordingly and puts the ownership on the students to complete the work, not the parents. 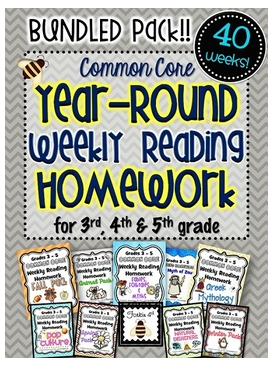 Last year the best purchase I made on TPT was the Common Core Weekly Reading Homework from Forkin 4th! I love consistency and start giving this homework out to my students at the start of school. When it is time for Open House, I add images into my Power Point so I can explain to parents what the students are expected to complete weekly. Each student brings their homework in on Friday, we correct it together, and I collect it to look at parent comments on the fluency. Last year this routine worked out amazing. The kids loved the high interest readings, their fluency scores definitely improved, and the parents loved the idea of getting the homework ahead of time. I was so proud of hearing my students converse with one another saying, "I have football tonight and tomorrow. I am going to do most of my homework tonight so I will have time!" Now folks, I'm not even making that up! I am still on summer vacation for another month...in fact, I'm not even done with teaching summer school, but I am already thinking about next year. I am adding Social Studies and Science into my class instead of just ELA and although I am a little nervous, I'm hoping I'll survive with lots of support from my blogging friends! Just in case you haven't heard, Robyn and I finally finished our Morning Work For a Year! 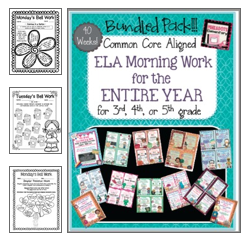 We are so excited because like the homework, it allows us to prepare for the year, it is Common Core Aligned, and the students LOVE the activities! Just in case you need some more persuading, check out the free WEEK of morning work I've uploaded as a sample! Being so prepared is definitely taking my jitters away from the back to school craze that is just around the corner. Hopefully these products will help you too!